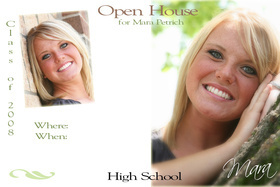 These fun cards custom designed with your school colors or logo really personalize your party. We will work with you until we get exactly what you are looking for. Sizes come in 4 x 8 or 5 x 7 and complete with envelopes. These are just a few options for your cards. We are more than willing to custom design one that fits your style or personality also. We usually do not charge for creation when you order 50 or more cards. At Passionate Portraits you are the boss! You pick colors, designs, size and font. Our goal is to create something you are proud to show off. Please visit our card gallery for ideas or cards already created.